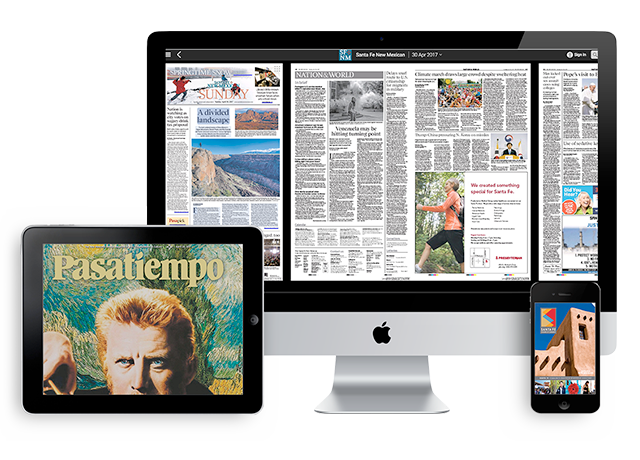 Read The Santa Fe New Mexican, Pasatiempo and more exactly as you would in print on your smartphone, tablet or computer. The eNewMexican combines the familiar look and feel of a printed newspaper with the benefits of a modern digital publication. Share articles via email and social media, have the news read to you, browse back issues and print out articles for your personal archives. See the Quick Start Guide below for key features. Easy to use applications built for Android, Apple and Windows smartphones and tablets make it easy to keep up on what's important when you're on the move. The Santa Fe New Mexican has covered the life and times of the oldest capital city in the United States since 1849, making the family-owned company the oldest daily newspaper west of the Mississippi River. The New Mexican has earned a reputation for the type of hard-hitting and serious reporting that few local or regional publications nationwide can offer. Readers of The New Mexican expect and receive insightful news, analysis and opinion journalism complemented by innovative digital features that convey the vibrancy of Santa Fe. As The New Mexican has built a reputation for its news coverage, Pasatiempo is the unmatched leader in arts and culture throughout the region. The nationally-acclaimed weekly magazine is a must-read for anyone seeking to understand the extraordinary creative energy that brings millions to Northern New Mexico each year. Each issue overflows with a unique mix of thought-provoking stories and reviews that span the worlds of music, dance, theater, literature, architecture, dining and exhibitions. © Copyright 2018, The Santa Fe New Mexican, Santa Fe, NM.